I live in Kilcumney, Goresbridge, Co. Carlow. I am married to Joan (Ralph) and have two children Tomás (28) & Kate (20). I am a councillor for the past 15 years. A member of recently formed ‘Borris, Our Vision’ group. 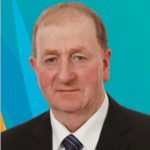 I am actively involved in G.A.A, camogie association, I.F.A, a committee member of; Borris Focus Group, Borris Hall Committee, Ballinkillen Lorum Community Centre. Assisting schools and communities in South Carlow obtaining CLÁR funding. Killoughternane Community Hall, St. Michael’s National School, Newtown Glynn National School, Rathanna, Garryhill Handball/Community, Drumfea National School and Garryhill NS have all benefitted from this funding. Ensure adequate funding allocated for road works. Lobbied Minister Ring with the help of Deputy Pat Deering & successfully obtained €650,000 funding for development of Borris Viaduct. Supporting applicants seeking planning permission & council mortgages. Actively lobbying for improved broadband service across all this area and job creation. I am involved in Blackstairs Farming Group which compensates farming for having an environmentally friendly approach to farming their commonage on the Blackstairs Mts. I have served as a councillor for the past 15 years and have built up a very strong working relationship with council staff and officials at all levels. If re-elected this experience would be vital in delivering maximum benefits to community groups and all individuals in the Muinebheag/Borris municipal area. Vote No. 1 Tommy Kinsella on Friday 24th May 2019. “To keep a hard-working councillor in your area”. CarlowKilkenny.com is a product of KCLR. Information correct at time of publication.